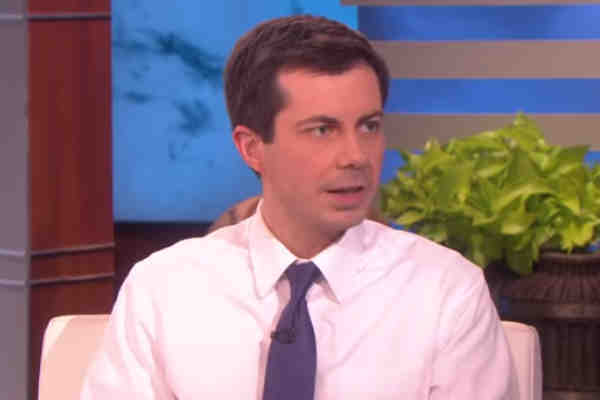 Appearing Friday on Ellen DeGeneres' daytime talk show, presidential hopeful Pete Buttigieg, the openly gay mayor of South Bend, Indiana, called on Vice President Mike Pence to support LGBT protections. On the campaign trail, Buttigieg has criticized Pence's opposition to LGBT rights. As governor of Indiana, Pence signed a bill into law that critics said would give business owners the right discriminate against the LGBT community. He's also supported therapies that attempt to alter the sexual orientation or gender identity of people who identify as lesbian, gay, bisexual and transgender, which suggests he believes being LGBT is a choice. Pence is also opposed to marriage equality. In an emotional speech on Sunday, Buttigieg took another swipe at Pence. In that speech, Buttigieg talked about how he struggled to come out and how his marriage to Chasten had changed his life. “Thank God there was no pill [to make me straight],” he said. In several interviews, Pence responded that Buttigieg “should know better” than to criticize his Christian faith. On Friday, Buttigieg told DeGeneres that he wasn't criticizing Pence's faith. Rather he's criticizing how Pence uses his religion to justify discrimination against the LGBT community. DeGeneres also asked Buttigieg how he reconciles his faith and sexuality. “It’s a message that is fundamentally about love, love and humility, humbling yourself before God and putting other people before you. And, again, that doesn’t have to be anybody else’s understanding of religion, but it’s where Christianity takes me. And that does have implications for how I behave in the political space,” he said. Buttigieg is expected to formally announce his presidential campaign on Sunday.